Details about the recent opening of studio schools and university technical colleges in England. Thousands of pupils in England are set to benefit from high-quality academic study combined with practical learning as more studio schools and university technical colleges (UTCs) open this September. The 11 new studio schools and three UTCs have the backing of business and industry, and offer young people an education that equips them with the skills employers want. The figures also mean that, between September 2011 and September 2012, a total of 97 new UTCs, studio schools and free schools have been opened by passionate teachers, parents, charities, employers and education groups. These schools are helping to give power back to teachers to raise standards in education, and are providing greater choice for parents. Studio schools offer academic and vocational qualifications, but teach them in a practical way. Study is combined with work placements - which are often paid placements - with local and national employers who are involved in the school. These include Fulham FC, the BBC, and the National Grid. UTCs are sponsored by a local university and employers, and they focus on providing technical education that meets the needs of modern business. Each has one or two specialisms - ranging from engineering, to manufacturing, to construction or bio-medical sciences. Both UTCs and studio schools are part of the government’s drive to ensure the education system responds to demands from employers for the skills they need to grow and prosper. New studio schools and university technical colleges will ensure more young people get great jobs. They are a brilliant way for employers to get more involved in education so that young people can be better prepared than ever before for the world of work. Aston University Academy of Engineering UTC, Birmingham, which will focus on engineering and science through a partnership between Aston University, the Science Technology, Engineering and Mathematics Network (STEMNET) and a range of industry partners, including the National Grid. Hackney UTC, London, sponsored by Hackney Community College, the University of East London, BT and Homerton University Hospital, will specialise in medical technologies and new digital technologies, working closely with the pioneering start-up companies based in Hoxton. Hull Studio School, Hull, sponsored by outstanding-rated Hull College, will focus on business and enterprise and will provide young people with the essential employability skills they need to enter the world of work, by working with local employers such as British Land and Humberside Police. The Studio College for Construction and Building Excellence, Stoke-on-Trent, will specialise in construction and give students the opportunity to learn in a small, supportive environment to get the qualifications and training they need to be work ready. Sponsored by Stoke-on-Trent College, the studio school will work with a network of construction industry partners including Wates Construction. UTCs and studio schools are new schools for 14- to 19-year-olds. Pupils of all abilities can choose to go to them at ages 14 or 16. These schools typically operate on business hours, and many have shorter school holidays. Studio schools offer academic and vocational qualifications to around 300 pupils. Study is combined with work placements (which may be paid placements at post-16) with local and national employers who are involved in the school. Learning in this way encourages students to develop skills like punctuality, good communication, reliability and team working, whilst gaining a strong grounding in English, maths and science. I am delighted that eleven new studio schools are opening this September, and the enthusiasm of parents and students for these schools is extremely heartening. Lack of work readiness amongst school leavers is a key issue for businesses up and down the country, and studio schools are designed to address this concern. With their unique combination of mainstream qualifications, real work, and the development of employability skills and entrepreneurialism, studio schools will play a vital role in providing young people with the skills and experience that our economy needs. UTCs are sponsored by a local university and employers, and they focus on providing technical education. Each has one or two specialisms, and students split their time between studying core academic subjects and learning specific technical skills and qualifications. The UTC curriculum is built around projects created by employers. This brings education to life - students understand not just what they are learning, but why - and where they can go next. It’s hugely exciting, hugely motivating and just what young people want. Employers report that they are struggling to find the skills they are looking for in school leavers. In the May 2010 CBI employer survey, more than two thirds of employers (70%) wanted to see the new government make the employability skills of young people its top education priority. Both UTCs and Studio Schools are part of the Government’s drive to ensure the education system responds to demands from employers for the skills they need to grow and prosper. They will also increase choice for parents and pupils in communities across the country. Aston University Academy of Engineering UTC will specialise in engineering and science and is being delivered in partnership between Aston University, the Science Technology, Engineering and Mathematics Network (STEMNET) and a range of industrial partners including the National Grid. In addition to delivering an integrated curriculum to both 14 and 16 year olds in the first year, it will also offer up to 15 apprenticeships, which will be delivered in conjunction with RS Fleet as the employer and the Sector Skills Council for Science, Engineering and Manufacturing Technologies (Semta). The Central Bedfordshire UTC is based in Houghton Regis, close to the new Junction 11a of the M1. It will specialise in engineering and manufacturing, with design the key prism through which these will be delivered throughout the curriculum. It is sponsored by Central Bedfordshire College, Cranfield University, the University of Bedfordshire and B/E Aerospace (UK) Ltd.
Hackney UTC is sponsored by Hackney Community College, the University of East London, BT and Homerton University Hospital. It will specialise in medical technologies and new digital technologies, working closely with the pioneering start-up companies based in Hoxton. Bournemouth Learning and Achievement Foundation School (LeAF) is a new Academy within The North Bournemouth Learning and Achievement Federation. The Studio School specialises in construction, health and social care and elite sport. Students will study for an academic core of GCSEs and A levels but will follow the progression route that works best for them, choosing either an academic or vocational emphasis, an apprenticeship, or a specialist sports programme. Students will work with local employers to build their knowledge and confidence of the world of work. Bradford International Food and Travel Studio School will be sponsored by Bradford College. The school will offer a range of academic and vocational qualifications taught principally through enterprise projects with the support of local and national employers in the hospitality and tourism sectors. Da Vinci Studio School of Science and Engineering is based in Stevenage and is sponsored by North Hertfordshire College. The school will offer students the opportunity to access a curriculum specialising in science, technology, engineering and maths. It will have a close connection with local and national science and engineering employers such as the European space company Astrium and Nelson Thornes publishing, who will be involved in all aspects of the curriculum. The Studio College for construction and building excellence is sponsored by Stoke on Trent College and offers a unique opportunity for 14-19 year old students to learn in a small, supportive environment to get the qualifications and training they need to be work ready. The curriculum is based around topics within the modern construction industry but the mix of academic and vocational learning will enable pupils to succeed in any modern working environment. A network of industry partners - all leading organisations in the construction sector including Wates Construction, Seddon and Keir - will work with the school to provide unique access to training and work experience for students. The Fulham Enterprise Studio School is part of the Fulham College Federation and specialises in construction, engineering and performing arts production. Students aged 14 to 16 will study the National Curriculum, working towards a minimum of five GCSEs, a BTEC in Business Studies as well as a specialist option subject. Students aged 16 and over will be able to study for BTEC level 3 and A level subjects relevant to general construction and performing arts production. The studio school is engaged with high-profile employers, including the BBC, Fulham FC and Age UK (Hammersmith and Fulham). The Hull Studio School is sponsored by Hull College, which has been recognised by Ofsted as ‘outstanding’. The main focus of the Hull Studio School will be business and enterprise and the aim will be to provide young people with the essential employability skills they need to enter the world of work. Students will have access to the College’s range of industry standard facilities in hospitality and hair and beauty sectors, by working with employers such as British Land and Humberside Police. Hyndburn Studio School is sponsored by Accrington and Rossendale College, in partnership with Rhyddings Business and Enterprise School. The school will tackle the challenge of skills shortages within the Hyndburn area by offering a curriculum that will combine academic and vocational qualifications aligned to the service industries which make up the local employer base. It will offer a wide range of specialisms in business and finance, sport, leisure, hospitality and catering, automotive technologies and media and marketing sectors. The Midland Studio College is proposed by North Warwickshire and Hinckley College (NWHC) whose partners include Motor Industry Research Association (MIRA Ltd) and George Eliot Hospital NHS Trust. The school will offer project-based, practical learning alongside mainstream academic study for 300 14- to 19-year-olds and specialise in engineering and health and social care. Its vision is to offer young people a fast track route into employment and a strong foundation for a successful career. Ockendon Studio School opened in July as part of Ockendon Academy which has an Ofsted rating of ‘outstanding’. The studio school aims to establish a centre for academic excellence and enterprise in South Ockendon, an area of high deprivation. The Studio School will offer a rigorously academic curriculum taught through practical learning opportunities presented in the form of community and business projects and work placements with local employers. This approach will bridge the gap between the skills needed by local businesses and those provided by a traditional school environment. Parkside Studio School is part of a Multi-Academy Trust with Rosedale College and Hewens College. It will offer an academic curriculum and practical work-based learning to 300 students in six specialisms; creative media, construction, hairdressing and beauty therapy, health and social care, hospitality and catering and sport. The curriculum will be taught through practical learning opportunities presented in the form of community and business projects with work placements with local and national employers, such as the Intercontinental Hotel Group. Tendring Enterprise Studio School (TESS) is sponsored by Academies Enterprise Trust, a sponsor of 14 secondary schools. It will specialise in enterprise and will focus on delivering vocational qualifications geared to the needs of the local SME economy, alongside core qualifications and employability skills. TESS is working with employers from the engineering, construction, hospitality and leisure sectors including Carillion Construction, JTRS (Apple Regional Training Centre) and Chelsea FC Foundation. 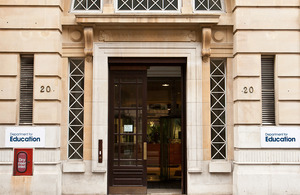 The Baker Dearing Educational Trust plays a key role in developing partnerships and advising on applications for UTCs. Two UTCs are already open - the first UTC, the JCB Academy in Staffordshire, opened in 2010 and then the Black Country UTC in Walsall opened in September 2011. A further 28 new UTCs are in the pre-opening phase and plan to open in 2013 and 2014. About Studio Schools. Studio schools are an innovative way for employers to get involved in helping to give young people the skills businesses need. They equip young people with the qualifications and skills to help companies prosper. Study is combined with work placements (which may be paid placements at post-16) with local and national employers who are involved in the school. Studio schools are aimed at young people who learn in more practical ways. They teach a rigorous academic and vocational curriculum in a practical way to typically 300 students aged 14-19. All Studio schools offer GCSEs in English, maths and science and other GCSEs and vocational qualifications which are recognised by employers and universities. Studio schools differ from other schools in the way they deliver these qualifications, to ensure that young people are developing the skills that local employers are looking for. Alongside their studies pupils carry out work placements for four hours a week, with employers who partner with the school. After age 16 this increases to two days a week and pupils are usually paid for this work. Each pupil has a ‘personal coach’, who replicates the role of a supportive line manager in the workplace. Coaches also help students get the most out of the curriculum and their work placements. For many pupils and their parents, the opportunity to combine studying for qualifications with developing skills that will give them the edge in the competitive jobs market will be very attractive. For other students, the opportunity to gain qualifications through this new approach will mean they are more engaged and perform better than in a more conventional school. Employers report that they are struggling to find the skills they are looking for in school leavers. In the May 2010 CBI employer survey, more than two thirds of employers (70%) wanted to see the new Government make the employability skills of young people its top education priority. The Studio Schools Trust plays a key role in promoting studio schools and advising on applications for studio schools. Five studio schools are already open including the first two studio schools in Luton and Huddersfield which opened in September 2010 (of these 5, 2 are brand new free-standing academies and three have opened as part of existing institutions). Of the eleven studio schools opening this September, 9 are brand new free-standing academies and 2 will be part of existing institutions (Fulham and Ockendon). A further 16 studio schools (all brand new academies) are currently in the pre-opening phase. Further information about studio schools and UTCs can be found on the Department for Education’s website, on the Studio Schools Trust’s website and the University Technical College’s website. 97 studio schools, UTCs and free schools have opened since September 2011. September 2011: 24 free Schools; 3 studio schools; and 1 UTC. September 2012: 55 free Schools; 3 studio schools; and 3 UTCs. In addition, 2 studio schools and 1 UTC opened in September 2010.